The third book in the Realmgate Wars series is unique in that it's the first not to tie directly into a source book. This allows the authors to really explore the new setting in a way the previous books weren't allowed to. So how does the first novel untethered by an existing story fare? Man oh man was this a great story. 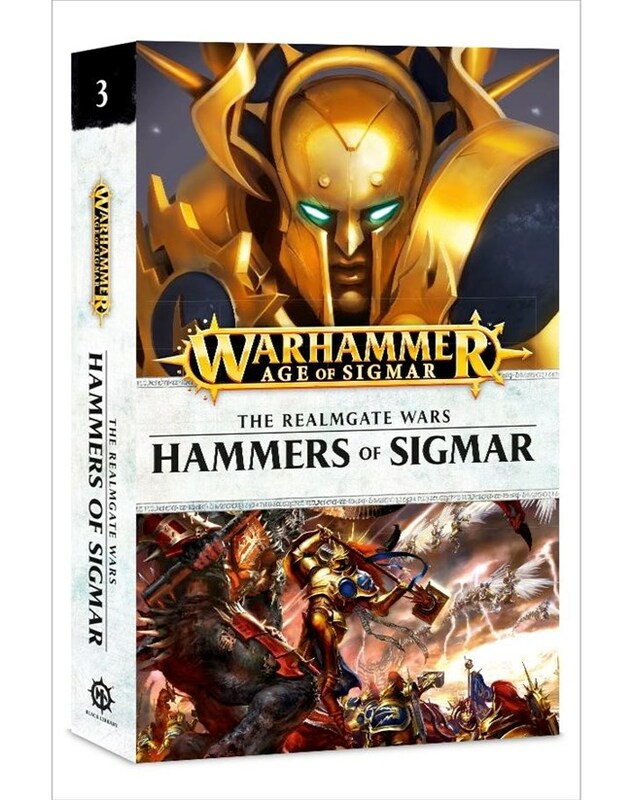 I seriously think this may be my top favorite Age of Sigmar story so far! To be honest, I was expecting it to be great from the get go. Darius Hinks is an amazing Fantasy author, and all of his previous contributions to Warhammer have been very, very good. You may not have heard of him before and that's because he is not as prolific with his Warhammer fiction as some of the other authors we are familiar with. It also seems like Black Library doesn't push his work as much as others, but when he does write something he hits it out of the park. Seriously, you should go back and read some of his existing works like Warrior Priest. This story has several very unique things going for it right out of the gate, the most obvious of which is that it's written completely in first person. This isn't utilized very often in Black Library fiction, so it's refreshing to see it from time to time. Now don't worry, we don't only follow one character's perspective in this for the whole time. Each chapter is told from a different character's point of view, which is announced as the title of the chapter. Sometimes we will get several chapters in a row all about one character, where at other times it jumps around between all of the characters for a few chapters. It reminds me very strongly of how the Game of Thrones (I know it's called A Song of Ice and Fire) books are structured. The character we follow the most and the protagonist of our story, is Lord-Celestant Tylos Stormbound. It's really rather fascinating being inside the head of one of the Stormcasts. We are so use to warriors confident in the knowledge of their abilities, but these guys really have no clue. For many this is their first major engagement, and even though they can't really die and are just reforged, most of them have never died yet, so aren't really sure what the process means or if it's even true. This is one of the things that I really like about the Stormcasts. There is so much about them that they don't even know yet. The story opens up in a fantastical fashion with the Stormhost arriving off target in what I assume is Aqshy. They have been sent to nullify a Chaos artifact called the Crucible of Blood, but instead have appeared miles away on a massive bridge spanning a yawning void. Did I mention the bridge was made up of the melded together bodies of a bunch of birds? Yeah, it's pretty crazy. There is also a moon hanging above them that keeps growing larger and larger as it nears them. Eventually while they are battling the Bloodbound on the bridge the moon gets so close that its gravity begins to pull the warriors off of the bridge and into the void. It's fantastical and fantastic. I love how crazy it is, and it's all portrayed in a very believable, realistic manner. All of that is just in the first few chapters too. We also follow the Stormhost's Lord-Relictor Boreas who must travel into the Realm of Death to ask for help from his former mentor, a very powerful necromancer. This is by far some of the most interesting scenes in the book. When I say the necromancer, called Menuasaraz-Senuamaraz-Kemurzil, or Mopus for short, was his former mentor, I mean in his past life, before Sigmar plucked him from the Mortal Realms. The interaction between the two is great. This is the first time Mopus has seen his apprentice since becoming a Stormcast and he is a little disappointed in him. He thinks of him as a religious fanatic that has abandoned the path of the scholar. It's a rather interesting viewpoint we have not seen before. The setting of where they have these discussions is great as well since Mopus' mansion is hidden from the forces of Chaos in Syish. One of the other characters we get a view point from is a sorceress enslaved to the Bloodbound chaos lord. She is only serving him begrudgingly and is actually hoping for Tylos to come and free her and kill her lord. The battles throughout are great, as well as all of the characters. There wasn't a single one I wasn't invested in. You really get to see how different the Mortal Realms are from what we are use to for Warhammer. At one point there is a ruined city floating in the air that's haunted by the spirits of its former inhabitants who just happen to be giants. I love the fact that there was at one point a city, a rather elegant one by the sounds of it, that had been built, maintained and lived in by giants. Other stand outs for me, a giant skeleton dragon, a rather interesting vampire, some Chaos infighting and a truly epic final battle. It's books like this that just make me more and more excited about AoS and the potential it holds for the future. I don't want to give away anymore of the plot or the interesting points that crop up throughout the rest of the story. I will just say that I couldn't put this book down and I completely devoured the story. Stormcast is longer then most of the novellas we have gotten so far for AoS and takes up the majority of this book, which is just fine with me. I really hope we get more stories from Darius Hinks, and I would love to see more stories about this Stormhost in particular. I cannot recommend this story enough. This is an absolute must read for all AoS fans, and I would even recommend it to non AoS fans to show them how awesome this fictional universe can be. The second novella in the book focuses on the Celestant-Prime, which had me super excited. I was very eager to read more about this mysterious character and find out more about him. Unfortunately we don't learn much more then we already know. The story opens with the Prime arriving alone in Chamon with a mission to kill the the Prismatic King. An entire Stormhost had been sent before to complete the same objective but mysteriously disappeared. Not dead though, because they never returned to Azyr to be reforged, just gone. This story is essentially a quest story, with the Prime trekking across the Realm (he doesn't want to fly so he can stay low key) trying to find this Chaos lord to kill. Along the way he comes across a mortal wizard whom he saves from a rogue beast. This wizard then offers to help guide the Prime to his destination. When asked what he should call him the Prime says Ghal-Maraz since that's what he identifies most with. While this makes sense in the fact that he needed a name for the story, it felt a little cheesy to me. He sees himself as merely the arm that wields the hammer, and less as a person on his own. As they continue their trek they find a few last survivors of the lost Stormhost who join with them in their quest. It really is a pretty archetypical story-arc and leads our group to assailing the Prismatic King's fortress, battling through demons, navigating a crystal maze and ultimately the final showdown. Honestly I wasn't that impressed with the story. I thought the Celestant-Prime could have been used in a better way. Like I said before, he hardly even flew the whole time and I feel like we didn't really get to see him use the full extent of his abilities. There is a hint at some type of connection between the man he use to be before being reforged and the Prismatic King, but beside that this story could have had any other Stormcast character in his place and it wouldn't have made much of a difference. It was an okay read, I wasn't ever bored by it, but at the same time I wasn't ever too excited about it either. It had a tough job following up the fantastic story by Darius Hinks, so that may had shaded my opinion on it a bit. It's also pretty short, which was fine with me. It never really stretches out events and any longer and it would have had to start doing that. It's a nice little addition to the book and worth the read. The first story is definitely the strongest, and how great it was balances out the somewhat lackluster second story. I think this book is a great addition to the Realmgate Wars series and I think is a must read for AoS fans based on Stormcast alone, and seeing the Celestant-Prime in action was pretty nice too.